We all know that the word Bonsai is Japanese for "tree in a pot" but did you know that the art of Bonsai originally began in China and was taken from the word "Penzai". Penzai means "tray plant" and over time was developed further with the Chinese word "Penjing" ("tray scenery") which is used quite much today. There are many books and exhibitions each year based on the art of Penjing. The relatively new word "Saikei" is the Japanese alternative to Penjing and the term means "planted landscape". To make a Saikei the design should include plants, soil, rocks and water to make a miniature landscape. There are two other Japanese words, "Bonkei" and "Bonseki" that also mean landscape but these are related to dry landscapes and no living material is used in these. The Vietnamese also have their own term, "Hòn Non Bô" meaning Island, Mountain and Water, for the art of living landscapes. Bonsai trees can be classified by their size. This is more important to understand if you ever want to enter your prized bonsai into a competition. Your bonsai will then compete against other bonsai in the same size classification. The exact size classification can actually change from country to country and from competition to competition but a general guide is shown below. The size classification relates to the height (H) of the main trunk from the base to the top. Bonsai trees are grown into different styles. The style used on the tree depends on the species of the tree. Some trees can be grown into many different styles, while others are limited to just one or two styles. The table below lists some of the most common styles along with the equivalent Japanese word and a description of the style. Formal upright style is a straight trunk that continues all the way to the top of the tree and has a uniform taper from the base to the apex. This style is mainly associated with conifers and in particular pines. The trunk in informal upright style curves one way and then the other from the base and continues to the apex. 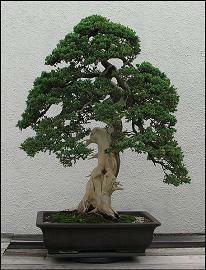 This style is the most common of all bonsai styles and suits almost all species of trees. The slanting style is a variation of the formal and informal upright styles. The trunk in inclined to either side. This style suits almost all species of trees. The broom style is the most authentically tree-like of all the bonsai styles. The trunk remains straight and branches fan out and the ends shaped to form a domed canopy. This style best suits deciduous trees such as maples. The cascade style is intended to simulate a tree clinging to the side of a mountain. The lowest point of the tree must fall below the base of the pot. The pots used in this style are deeper than they are wide. Conifers such as pine and spruce are best suited to this style. The semi-cascade style is simialr to the cascade style and simulates a tree clinging to the side of a mountain. The lowest point of the tree must fall below the rim of the pot but not the base. The deep and the wide of the pots used in this style are very close in size. The literati style is a single conifer with a slender trunk and minimal foliage. The style is named after a group of chinese scholars who established it. The windswept style is one of the most difficult to create successfully. The tree must look like it lives on an exposed hill-side. To create a forest an odd number of trees of a similar style are needed. The thicknes of the trunks and heights must vary to give the impression of depth. This style suits almost all species of trees, but trees with small leaves give the best results. This style is to simulate a tree growing on a rock where the soil has been washed away to expose the roots growing tightly against the rock. This style suits the most common conifer and deciduous trees that have thick and sturdy roots. This style is similar to the Root-Over-Rock style but without the rock. This style is rare to see because it is difficult to create. Bonsai made in this style are highly prized because there are so few.